Synthetic transmembrane anion transporters (anionophores) have potential as tools for biomedical research and as therapeutic agents for diseases associated with anion-channel dysfunction. However, the possibility of H+ or OH− transport by anionophores has received little attention, and an anionophore selective for Cl− over H+/OH− is currently unavailable. Here, we show that depending on anionophore acidity, many anionophores facilitate electrogenic H+ or OH− transport, potentially leading to toxicity. 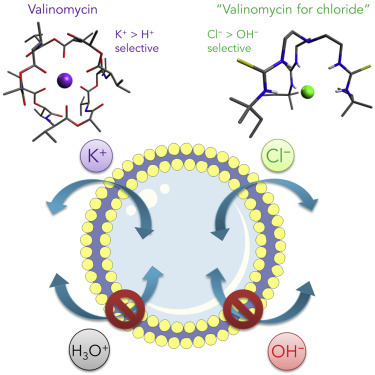 Nevertheless, using several liposome-membrane-based assays, we identified two newly developed small molecules that promote electrogenic Cl− transport without effectively dissipating the transmembrane pH gradient, essentially mimicking the electrogenic cationophore valinomycin. The Cl− > H+/OH− selectivity of anionophores showed a consistent positive correlation with the degree of Cl− encapsulation and a negative correlation with the acidity of hydrogen-bond donors. Our study demonstrates that a valinomycin equivalent for Cl−-selective transport is achievable.